*Watty Winner* & *Featured Story* WITCHES - NECROMANCERS - INAPPROPRIATE TABLE MANNERS. The three-hundred-year-old town of Loon Lake looks calm as a pond, but below the surface, clans of witches and wizards clash like hungry sharks. First-year student Tonya isn't privy to her family's darkest secrets, but when campus is overrun by a deadly eating epidemic, only she can resist the hidden, mind-controlling entity behind it. Meanwhile, Tonya's new friends, artist Priya, and Digital Ninjas Drake and Zain, want to create the creepiest art installation Loon Lake Cemetery will ever know. Too bad what's lurking in the graveyard is deadly. Untrained and overmatched by occult conspirators, Tonya will need to develop magical abilities she never knew she had. Can she uncover the mystery behind the epidemic and save her town? 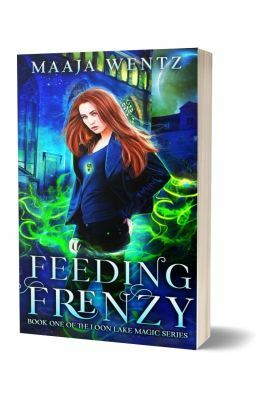 Winner of the coveted Watty Award, supernatural thriller Feeding Frenzy is a witch's brew of intrigue with a dollop of comedy, a teaspoon of romance, and a pinch of horror. Readers say: "It's been an amazing ride! ...I've loved every minute of it!" -J. L. Weaver, author of the Penderry's Bizarre series (England) "A great ending! Loved it!" -Denise Murdoch (USA) "Just when you think there won't be any more surprises, Maaja Wentz throws us for a loop." "It's like I'm infected and you're food because I NEED MORE." -Helaine Duvenhage (South Africa) "...great novel - it has been so much fun to read! The ending wrapped things up nicely, but it begs for a sequel. With Tonya's discovery of her powers and the hints at this Loon Lake magic community...it feels like there is much more to come for Tonya and the gang." -David J. Thirteen (Canada) Zombie...meet cake. Take a spooky town, a food obsession and wrap it all up in a wee bit of @MaajaWentz creepy, ghoul-tainted humor and you end up with the kaleidoscope that is Feeding Frenzy. -Jetta Frame for WattZombie reviews (Wattpad) Vote, comment, and tell friends about FEEDING FRENZY. I'd love to hear from you.